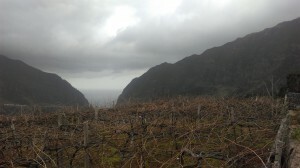 Vineyard views from the north side of Madeira. Like few other wines in the world, the wines from the island of Madeira are synonymous with their distinctive method of production. For centuries, producers here have fortified their wines with neutral spirits, then aged the wines in cask for long periods of time, oxidizing them and exposing them to heat. The result is one of the world’s winemaking gems — a seemingly indestructible wine that can age for centuries and retain its exotic characteristics for long after the bottle is opened. After a week-long trip this Portuguese island, I have a whole lot to write about these magnificent wines and the island and people responsible for them. But, first, I wanted to explore the state of the island’s still wines. Yes, they make unfortified, dry, white and red table wines on Madeira. The wines ranged from the eccentric and odd to the refreshing and impressive. The entire island is home to less than 500 hectares of vines, which cling to unreasonably steep hillsides in tiny, terraced vineyards. And still wine production counts for a mere 4-5% of the island’s total production. So there are not a lot of bottles to go around. The still Madeira wines (which fall under the appellation “DOP Madeirense”) are made in very small quantities, and the majority of the wine stays on the island. But the evolution of the still wine movement in Madeira signifies a desire to adapt and innovate. And that’s notable for a tremendously regulated wine industry on an island typified by a stick-to-your-guns respect for tradition and history. As a collective group, DOP Madeirense white wines are fresh, vibrant, low in alcohol, high in acidity, and laced with citrus peel and floral flavors. Like seemingly everything produced on the island, the wines exude a sense of sea salt and oceanic vibrancy. As a surfer and lover of all things of the sea, these wines excite me. And they’re perfectly matched to local cuisine like lapas and scabbard fish. The red wines (frequently blends of two to five varieties) tend to have lighter tannic structure, high acidity, crunchy red fruit and plenty of earth and spice elements to go around. While these wine are quirky, tasty and fit well on the table, it makes little sense for producers of still Madeira wine to export them. Portugal (which everyone here calls the Mainland) produces plenty of Verdelho, for example. And the Mainland has plenty of not-so-treacherous places to grow grapes. Like any major wine category, Mainland Verdelho can be very good, but there are many serviceable wines with large production and moderate price tags, something Madeira producers simply cannot match. A wine competition between the Mainland and Madeira is like pitting a heavyweight against a bantamweight. Madeira winemakers aren’t eager to step into that ring. On the other hand, it makes little sense to import brisk, fresh white wines that pair wonderfully with local seafood when producers have access to at least some amount of quality white grapes on the island. More than one million people visit Madeira every year, and those people want to eat and drink everything the island has to offer. Madeira already imports a large amount of the food that appears on the restaurant table. Some producers figure they can make still wines for consumption right here on the island. And I’m glad these wines exist. This certainly seems to be the case. Verdelho shows real promise as a still wine on Madeira. Several producers have bottled crisp, dry, bright examples of this grape, while others have blended it with an interesting mix of grapes (like Arnsburger) not used for the production of Madeira. No one makes a commercially available still Malvasia, although I’m intrigued about the concept. However, there’s not a ton of the grape planted on the island, and the juice goes on to produce one of the most delicious and long-lived wines of the world as a fortified sweet wine, Malvasia or Malmsey. So producers aren’t rushing to bottle, crisp, still wines for pounding on the patio. Same goes for Sercial and Boal (the other white grapes used for fortified wines). Considering the rigid rules for Madeira production, it’s exciting to see producers experimenting with still wines: blending traditional white grapes with less traditional ones; using grapes like Syrah and Cabernet Sauvignon; trying out blends of traditional Portuguese red grapes like Touriga Nacional and Tinta Roriz. I tasted one Verdelho and Arnsburger blend that was aged in some new oak. I thought the oak totally overwhelmed the brisk, salty elements of the wine (ultimately I didn’t enjoy the wine), but still wine producers are trying new things. And I like that. The total production is small, but the passion is evident. While Madeira producers are obviously well equipped with the casks and space needed for the canteiro process (cask aging with exposure to heat and oxygen), many do not have the equipment needed to produce still wine. That’s where the MWI comes in. In 2002, the MWI set up their own winery with all the presses, tanks, etc., capable of producing still wine. And they allow producers to use that equipment to make their own still wine. However, producers have to cover the cost by paying the Institute for this service. Considering producers already have what they need to make fortified wine, this added cost is yet another barrier to the large-scale production of still Madeira wine. Despite these hurdles, Barbara Spinola of the Institute’s Promotion Department, said there is strong support for the still wine project among Madeira producers. Today, she said, there are now more than 10 different still wine brands. 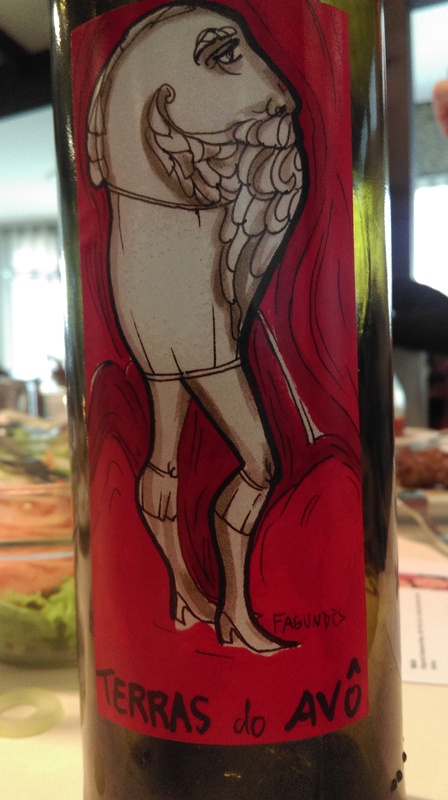 While the production of still white and red DOP Madeirense wines has grown, there doesn’t seem to be much long-term prospect for significant growth in this area. To fully invest in making still wines on the island, growers and producers would have to make a sharp turn away from their deeply-held tradition of producing of the world’s best fortified wines. And there’s simply no impetus for making such a dramatic shift. But a large fortified wine industry and a small still wine industry can both exist in the same place and time. And I hope there continues to be at least some demand for these still Madeira wines. When eating a piping hot plate of lapas, or some steamed scabbard fish, sipping on a brisk local wine is a tremendous experience. And for those looking to expand their palates and try new things, don’t hesitate if you see a rare bottle of DOP Madeirense. It won’t be the best still wine you’ve had all year, but it will certainly offer up a unique island experience. And if you visit Madeira and sit down at a restaurant, don’t think twice: order a DOP Madeirense. Below are my tasting notes on a few of the still Madeira wines I tasted on a recent trip. All the wines were tasted sighted.